Roadburn are very pleased to announce that C R O W N will bring their massive slab of industrial-doom-noise to Roadburn Festival 2013 on Thursday, April 18th at the 013 venue in Tilburg, Holland. 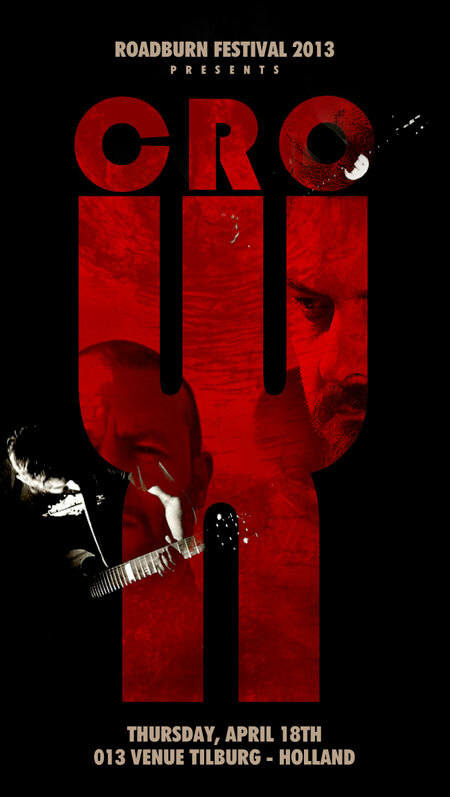 Hailing from France, C R O W N, are two men and a machine who tune their neutron guitars to the Richter scale, and deliver the sound of a molten universe collapsing. Touching on early Isis, Godflesh, Floor and even Killing Joke, C R O W N explore the depths of slow tempos on their debut album, The One, and their split EP with St Valley through sheer exuberant heaviness. The duo’s depth-charging guitars and buried melodic tendencies snake around hissing electronics, a tribal / military percussive thwack, and the splashing cymbals of a minimal-yet-completely-effective drum-machine. Their sound is further emboldened by a massive bestial roar, heavy and oppressive, leading to an abyss of nothingness…. Welcome to the dark, spiraling, and obscure experiments of C R O W N.